East Bay chefs are experimenting more and more with using beer as an ingredient — and what they're coming up with might surprise you. 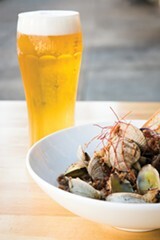 Hopscotch uses Asahi in its broth for beer-steamed clams. Kyle Itani remembers his first foray into cooking with beer — if a bit sheepishly: "It was beer-can chicken," he recalled. "Which is kind of funny." Funny because it was a prosaic start for someone who's now mixing obscure Japanese beers into high-concept Asian-American dishes at one of Oakland's newer and hotter restaurants, Hopscotch, and because it's also a pretty good metaphor for the world of cooking with beer, writ large: While beer-battered fish and, yes, beer-can chicken, have long been staples at the dinner table and the pub, recent years have seen beer show up in more dishes, at more restaurants, and in more unexpected places. At Berkeley's Freehouse, chef Kevin Kroger cuts pilsner into cheddar for mac 'n' cheese and porter into barbecue sauce for his pulled-pork sandwich; Jupiter, meanwhile, incorporates its hefeweizen into chicken pot pie and its porter into barbecue pork riblets. At Pyramid Brewery's Berkeley alehouse, Joe O'Leary uses the brewery's beers in no fewer than fourteen of his menu's standard dishes, including a hefeweizen chili and a sweet-potato fries side served with IPA curry sauce. Beer is even showing up in desserts: Dan Del Grande — president of Berkeley's Bison Brewery and a pretty accomplished at-home beer chef himself — swears by his Chocolate Stout pancakes (!) recipe. Kroger said that one of Freehouse's most popular desserts is a float made with Guinness ice cream and Old Rasputin beer. And it's not just brewpubs, either: Hopscotch is a sleek, NorCal-inflected fusion restaurant with a trendy aesthetic dishes that go far beyond pub-grub standards like wings and burgers — and three dishes on its rotating menu that incorporate beer. Ask a chef like O'Leary and all this is something of a no-brainer: Beer is just another weapon in any chef's arsenal, one that, like other ingredients, can deepen a dish in unexpected ways and produce the kinds of can't-put-a-finger-on-it flavors many chefs strive for. "Cooking with beer helps accentuate the flavors of not only the beer but the food," he said. "It's unbelievable; it really brings it to another level and ... adds a whole different complexity. In the restaurant, people are always like, 'Why does this dish taste so much better than normally?' And it's always because of the beer." Ashley Routson, who has developed several beer recipes for Bison with Del Grande, explained it in terms a brewer would use: "Cooking with beer allows you to concentrate some of the specific flavors that we work to bring out in different beers" — the subtle yeastiness of a hefeweizen or a witbier, the nutty flavors of a porter, the bitter notes of an IPA. "And when you're cooking, you're always looking for new ways to add flavor without using water, which dilutes stuff," Routson said. "Chefs use stock and broth all the time in their food, so using beer is just taking it to the next level." Beer's texture makes it a good meat tenderizer, she said, and it can add a kind of lightness most liquids can't (hence, its use in batters). All of this is coming as new knowledge for the East Bay's batch of beer-oriented chefs, seeing as most kitchens and cooking schools still subscribe to fairly old-school ideas about alcohol and food. "Growing up in kitchens, it's wine, wine, wine all the time," Itani said — "never beer." 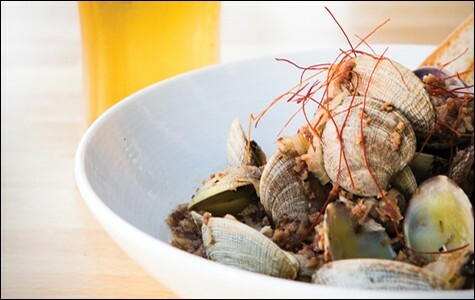 But he remembers vividly the dish that turned him onto cooking with beer a few years ago: "It was this really spicy clams dish, and I was drinking an IPA with it. And I remember thinking, these flavors go so well together, and I don't think I could've had this pairing with wine." 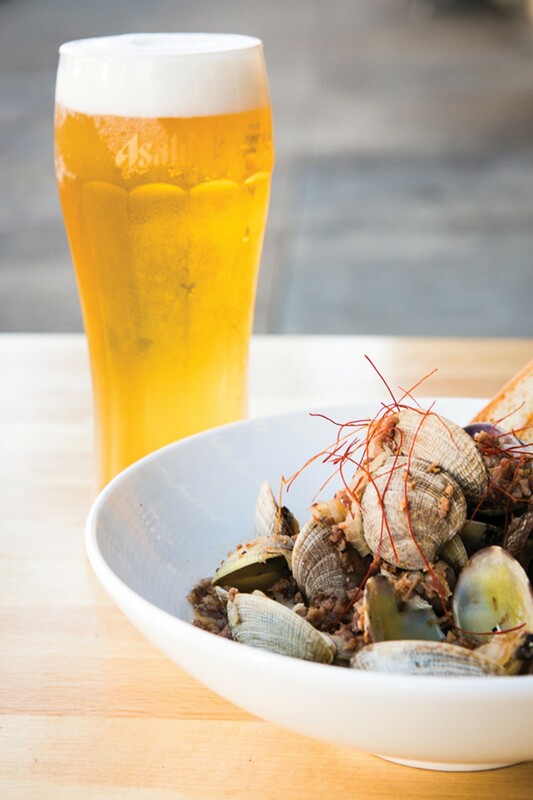 That dish ultimately served as inspiration for two dishes on Hopscotch's menu, both of which prominently feature clams marinated in Asahi, a Japanese beer. "A lot of chefs are trained to use wine," said Del Grande. "But beer's on tap, it's right at their bar, it's relatively low-cost." And especially in the East Bay — as small breweries continue to thrive, beer culture becomes more serious about process and ingredients, high-quality brews become easier and easier to get, and identifying flavor notes becomes just as natural for beer as it is for wine or whiskey — it's a trend that will likely continue. "This is something I only see getting bigger and bigger in the next ten years," said Kroger. "It's not just Guinness and Heineken and Silver Bullet anymore — you have such a wide variety of styles with beer now." That variety is smaller and subtler with wine, he said. "With wine you basically have red and white and there's different small characteristics, but with beer, you've got American strong ales, you've got barleywines, you've got imperial stouts, you've [got] wheatier beers, and they all have absolutely unique flavors within themselves. So you just have a much broader area to work with. But it's hard, because so much of classical cooking uses wine." There's definitely an "intimidation factor" with beer, Kroger said: "Most of my chef friends are still a little timid" — and it's hard to blame them: Beer offers unique and variable textures and flavors, and is far from fail-safe. Cooking tends to concentrate flavors, so while malty beers typically lend dishes a nice, mellow sweetness, hoppier ones can often translate to inedible bitterness, and it seems like every chef has a horror story. Kroger remembers using an IPA to deglaze a pan for risotto and finding that the finished product was pretty much impossible to eat. O'Leary recalls his first couple attempts at cooking with IPA as "just really, really bad. The oils can kind of take over and it just becomes beyond bitter." Basically, what it seems to come down to is the same as with any ingredient: balance and restraint. Routson recommends using citrus-forward beers with seafood, malty beers with grilled meats, and intensely flavorful beers as a marinade rather than a base. O'Leary, meanwhile, has found that IPA marries well with coconut, malt-forward tend to be the most versatile, and yeasty beers work well with the sulfuric compounds in eggs: He makes a lemon-Hefeweizen crème brulee that he says is "really popular" at Pyramid. He had very little experience cooking with beer before he came to the restaurant about five years ago, and it's been a trial-and-error process. "But it's really fun to experiment with this," he said. "It's a very exciting place to be."